A new issue from Academy. 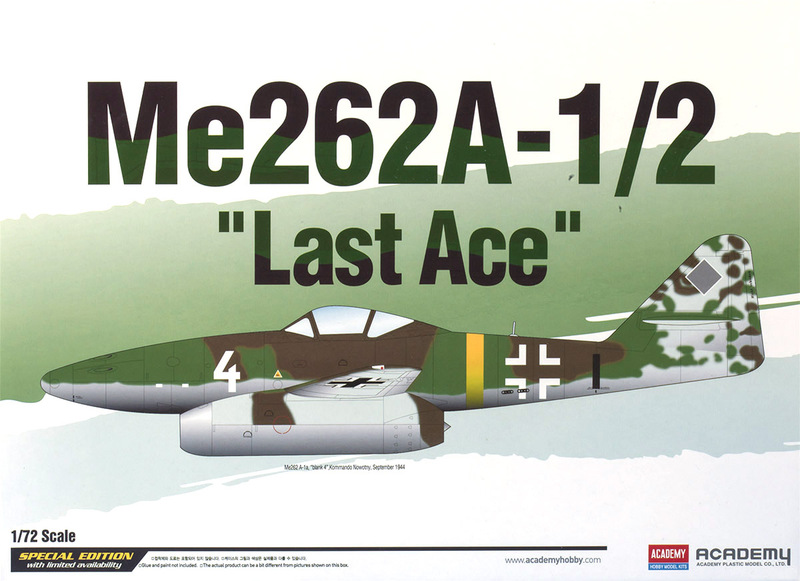 Nicely timed to steal some of Airfix's 'thunder' as they prepare to release a real 'new-tool' Me 262 in 72nd, this Academy tooling was first released back in 2007! It is reasonably detailed but as with a number of Academy WWII kits the basic outline shapes are a bit off; the fuselage is rather fat and wide with an overly bulbous nose. 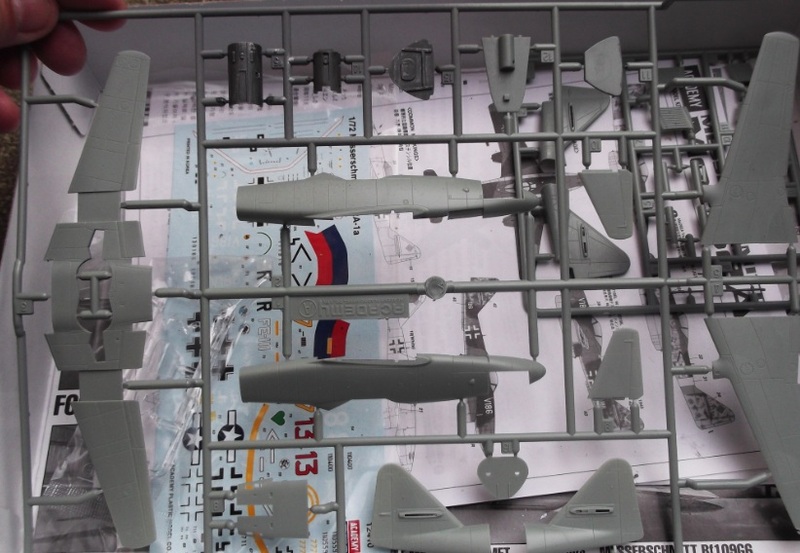 The Academy glazing is, for example, far too wide for the Revell kit. I had a cracked Revell canopy and needed to replace it - not possible with the Academy canopy which also happens to be a tad 'flattened-out' at the top. 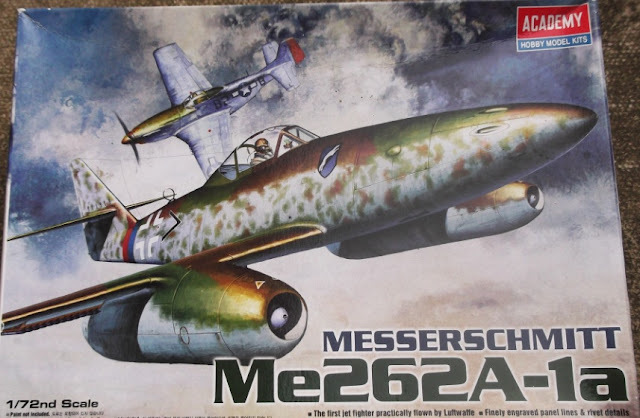 Still, you get two sets of tail parts in the box, one for the rocket-powered Heimatschuetzer variant -albeit inaccurate -and the decal sheet is good, although in this release doesn't feature the rocket-boost variant. However quite who the 'ace' in 'white 4' is we'll never know ! The yellow fuselage band and the well-known “snake” or 'tadpole' camouflage pattern on the tail fin assigned to Kdo. 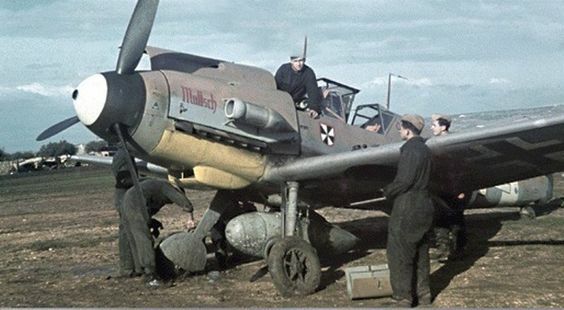 Nowotny is another Luftwaffe 'myth' that refuses to die! The Galland machine is given as 'white 3' whereas more recent photographic research for his 'white 5' is now widely known - see the picture/artwork in Aces No.3 in my last post. Personally I'd check out the new Airfix release first (due imminently) - and at quite a bit less than the cost of this one too no doubt.